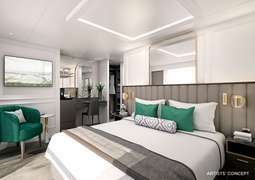 On board the Crystal Mahler, guests can chose from three cabin options, each containing a balcony window view. Choose between either a two bedroom or one bedroom suite with butler service and all the modern amenities one would desire. All suites are spacious and tastefully decorated. On board guests can chose from multiple dining options. Depending on your mood, you may want to have a meal in the Waterside market or perhaps a quick bite in the bistro room is better suited to your style. A la carte and buffet options are available and if you are an early riser you can try one of the many lavish breakfast offerings. You can always chose to eat inside or outside. Don't forget to take advantage of the in-suite hors d'oeuvre service as well as 24-hour room service. Make each port of call an even more rich experience by taking part in the lecture series on board from the regional experts who can give you exclusive insight and tips on the fascinating destinations you will visit. In addition to a state-of-the-art fitness Center, you can be sure to keep fit by taking part in one of the daily yoga and fitness classes that are offered. If you enjoy walking then you may want to take advantage of the complimentary Nordic walking poles offered as well. Then, after that beautiful day of walking you can relax with our massage service. During the day guests can dress in casual attire, including for dining room. Swimsuits, robes and baseball caps are not, however, appropriate. Comfort is key for sightseeing while off the ship so remember to have a good pair of walking shoes. For the evening, the dress code is Crystal Casual, which is a dressed-up version of casual looks. A unique and defining opportunity offered complimentary on the Crystal Mahler is the Michelin Starred Restaurant experience. Partnering with carefully selected restaurants in certain ports, this gives guests the opportunity to have an enriching culinary experience like nothing else. This service must be reserved through the Priority Check-in & Planning Center.